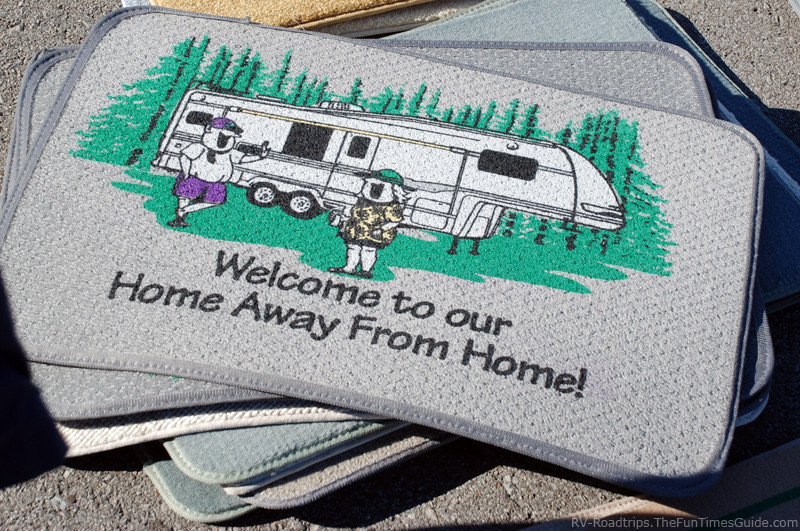 So you’ve moved into your RV, and you’re feeling like you’re sitting in a carbon copy of hundreds of other RVs sitting on the dealership lots and RV parks around the country. What can do you do next? 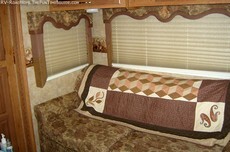 I have always felt like my RV is MY HOUSE, and I’m going to decorate it to suit my tastes. My oldest daughter is an artist, and when I had my house, I always had her original works of art hanging on the walls. I don’t have as much room or as many walls now, but I still have a couple of pieces of her art. I took down the cookie cutter framed prints that came with my trailer immediately, and put up two of Becca’s paintings. I also have a collage frame, with pictures of all the children and grandchildren in it. I try to keep the pictures in it updated. When we are traveling, I take them down, wrap them in a bath towel, and put them under the bed. I love to sew and make quilts. I usually have one or two on display in my trailer, thrown over the back of the sofa or on the rocking chair. They really come in handy in the winter months, too. Jim and I bought several throw rugs in bright colors that compliment the factory decor of the rig. They not only add our own personal touch, but also help keep the carpet clean. This key rack was something we have had since our dating days. It was one of the very first things Jim ever bought for me. It was one of those things with which I could not part. Now it is on the wall next to the entry door, and holds our keys, gloves, and reusable grocery bags. Since there was no toothbrush holder by the bathroom sink, we went to Target and got this beautiful ceramic one. There is matching soap dish on the other side of the sink. They have many pretty designs from which to choose. Because I am a sewer and crafter, I needed a place to store my materials used for my many projects. 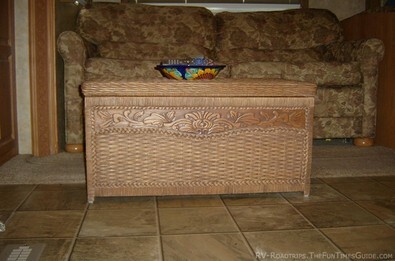 We bought this wicker trunk right after we bought our first RV trailer. It holds quite a bit of fabric, glue sticks, patterns, thread, and sewing equipment. It also doubles as a coffee table in front of the sofa. It fits right next to the rocking chair, out of the way of the entry door, when we travel. This would make a good place to store extra blankets and winter coats, too. You might also notice that pottery dish on the trunk. We used to collect pottery at the house. I bought this piece in Mexico, and use it to hold remote controls, and the stuff from Jim’s pockets. 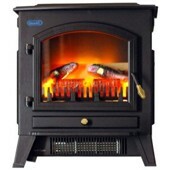 I have a friend who took out all of the original furnishings in her motorhome and replaced it with a double recliner loveseat and an electric spaceheater that looks like a fireplace. It even has a mantel. She built bookcases on either side of the “fireplace”, where she keeps pictures of her children and grandchildren, books, and her computer. It looks very homey. These are just a few examples of things you can do to make your living space truly yours. Just use your imagination, and things you love, to come up with your own look.